Dieser robuste Logger verfügt über ein eingebautes Keyboard, Display, und einen PCMCIA Karteneinschub. Er kombiniert eine 16-bit Auflösung mit einer maximalen Scanrate von 5000 Messungen pro Sekunde. Der CR5000 ist mit eingebauter Batterie erhältlich oder mit Flachrückwand ohne Batterie. Durch seine zahlreichen Eingangskanäle ist er ideal wenn viele analoge Sensoren gemessen werden sollen. Er kommt v.a. bei Fahrzeugtests oder in schnellen Messungen an Bauwerken oder in der Umwelt zum Einsatz. High throughput makes the CR5000 a powerful tool for demanding configurations. Integrated PCMCIA slot accepts memory cards up to 2 GB for stand-alone data collecting. The CR5000 typically includes an integrated 7-Ahr rechargeable power supply, but a no battery base option is also offered if a user-supplied power supply is preferred. This data logger has a 128 x 64 pixel backlit graphical or eight-line numeric display, and a 16-character keyboard for on-site control. Its on-board PCMCIA card slot allows the CR5000 to store data on a Type I, Type II, or Type III PCMCIA card, or on a CompactFlash® card if an adapter is used. 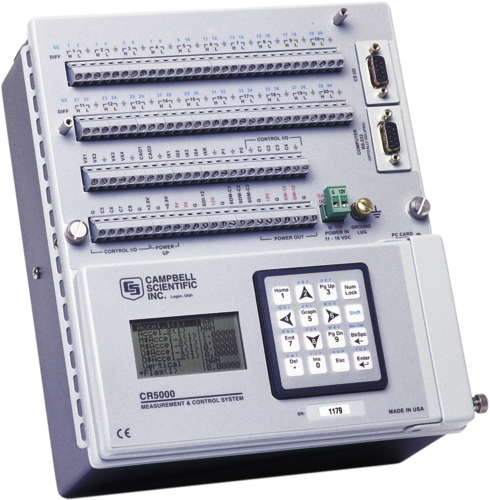 The CR5000's operating system includes measurement, processing, and output instructions for programming the data logger. The programming language, CRBasic, uses a BASIC-like syntax. Measurement instructions specific to bridge configurations, voltage outputs, thermocouples, and pulse/frequency signals are included. Processing instructions support algebraic, statistical, and transcendental functions for on-site processing. Output instructions process data over time and control external devices. These instructions include averages, maximums, minimums, standard deviations, histograms, rainflow histograms, level crossings, and Fast Fourier Transfers (FFTs). -NOTE- Note: Additional specifications are listed in the CR5000 Specifications Sheet. The rechargeable battery base has a different temperature range (-40° to +60°C). With several channel types, the CR5000 is compatible with nearly every available sensor, including thermocouples, SDI-12 sensors, and 4 to 20 mA sensors. The CR5000 is compatible with our multiplexers, vibrating-wire interfaces, terminal input modules, relays, and most of our SDMs. The CR5000 communicates with a PC via direct connect, NL100 Ethernet interface, multidrop modems, short-haul modems, phone modems (land line and digital cellular), RF telemetry, and GOES satellite transmitter. Data can be viewed on its on-board keyboard display. Storage capacity can be increased by using a PC or CompactFlash card. The CR5000's PCMCIA card slot supports one Type I, Type II, or Type III PC Card or the CF1 adapter and one CompactFlash (CF) card. The storage capacity of Type II cards exceeds 1 GB. Type III cards provide data storage capacities exceeding 1 GB but may not be suitable for all environments. Campbell Scientific offers CF cards that store up to 2 GB of data. Please note that the PCMCIA and CompactFlash cards need to be industrial-grade and have a storage capacity of 2 GB or less. The CR5000 is often powered by its on-board rechargeable power supply (see Ordering Info). When the rechargeable power supply is used, its internal 7-Ahr sealed rechargeable battery needs be charged via a vehicle (requires the DCDC18R), solar panel, or ac wall charger. The CR5000 can also come with a low-profile base that requires a user-supplied dc source. It is preferred when the system’s power consumption needs a larger capacity battery or when it’s advantageous to have a thinner, lighter data logger. CRBasic, the CR5000's full programming language, supports simple or complex programming and many onboard data reduction processes. What type of filtering is available for a CR5000? What type of cable is needed to communicate between a cellular digital modem and multiple CR5000s? Multiple CR5000s may not be directly connected to a single cellular digital modem. What can be done to manage an extremely large file that was created using the Append to End of File option? If the file is a TOB1 or TOA5 file format, use the File Format Convert utility to create smaller files, based on time. The File Format Convert utility is part of LoggerNet and is located here: Start | All Programs | Campbell Scientific | LoggerNet | Utilities | File Format Convert. How is it possible to measure different sensors at different sampling frequencies in a single CR5000 program? Create additional scans using the SlowSequence instruction. Can a CR5000 handle multiple sensors that need to be wired (3-wire construction) in a quarter-bridge configuration? Yes, as long as the equivalent bridge resistance is not so low as to exceed the current that can be sourced by an excitation channel. Can the burst mode be used with a CR5000? If so, what is the maximum sampling rate? Yes, burst mode can be used. The maximum sampling rate depends on the number of sensors and the integration. What additional equipment is needed to send data from a CR5000 through a cellular digital modem? Can a CR5000 be used to provide data to web pages? In a CR5000 program, what is the best way to create two separate scans running in PipeLineMode? Only one scan may be executed in the main scan. However, additional scans, running at longer scan intervals, may be added to a program using the SlowSequence instruction. Does the CR5000 have anti-aliasing filters on its analog inputs?